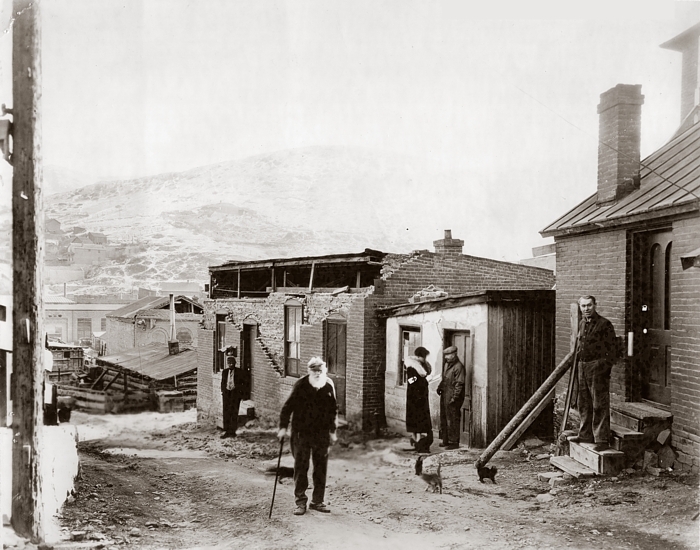 Once housing for miners and prostitutes, once a would-be art colony, Reeder's Alley has seen many changes over the past 140 years. Today, it houses a variety of business and offices. It has been owned by the State of Montana since 2000. From "Helena - City of Gold", a promotional film produced in 1973 by the Helena Chamber of commerce. 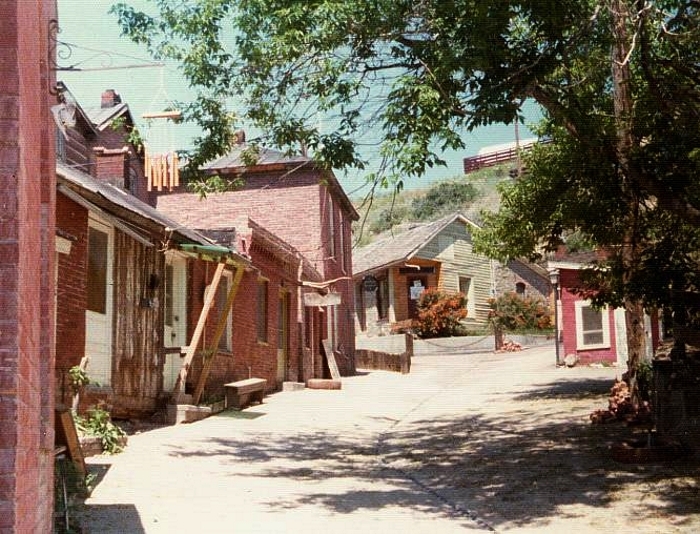 Lower part of Reeder's Alley after the 1935 earthquakes. A Red Cross worker is seen interviewing residents. There are some interesting details in this photo, including five cats. 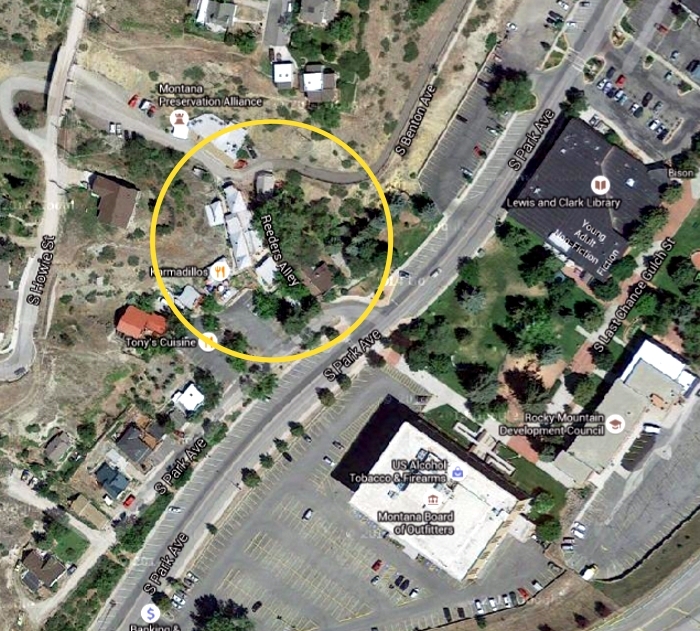 Also notable are the hillside homes in the background. 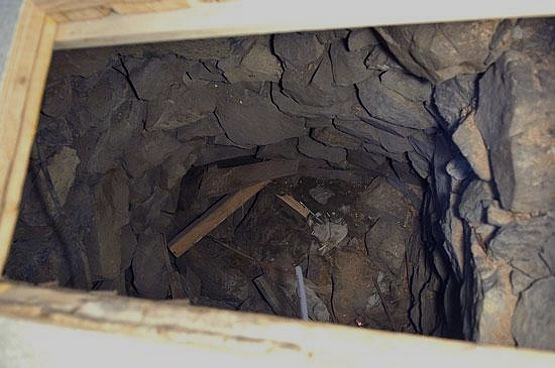 In May of 2008, two stone-lined pits were discovered beneath the the floor of the 1870s building which once housed the Stonehouse Restaurant. Click here for the story in the Independent Record. 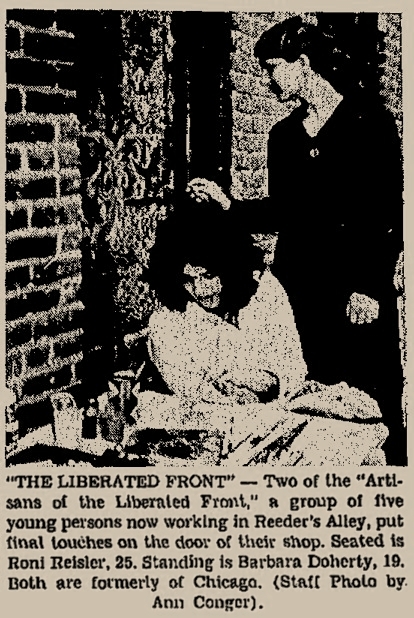 "ARTISANS OF THE LIBERATED FRONT"
In January of 1969, a group of five young Midwesterners drifted into the Helena area. The names they went by were Gillian Fox (20), Roni Reisler (25), Barbara Doherty (19), Paul Barron (19), and Robert Montgomery (19). 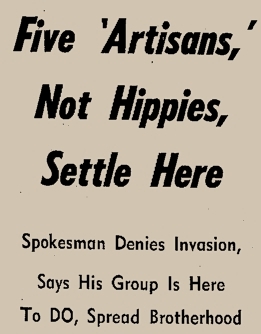 They slipped out of town six months later with a Federal Warrant following them, running from a flurry of worthless checks, a series of betrayals, and a town soured on the new phenomenon of "hippies". 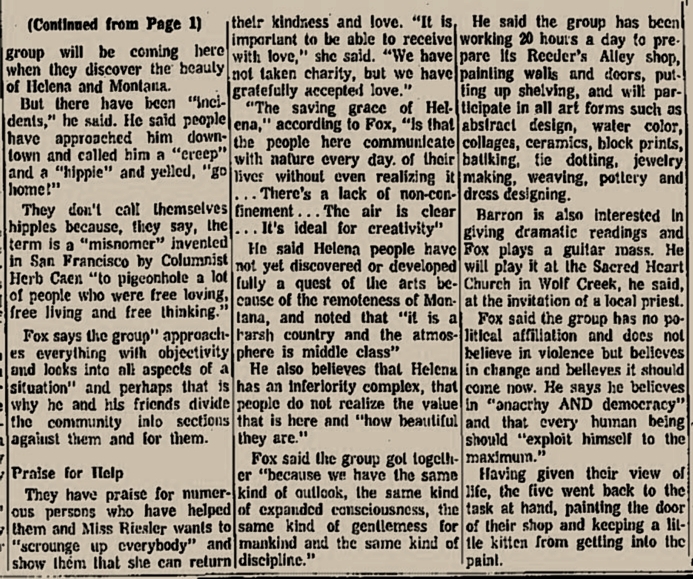 Fox's jive is laughable today, but in 1969 it seemed to gain a degree of traction in the community, which is certainly what Fox was counting on. The Artisans opened a checking account at the Union Bank, and set about creating a public image. 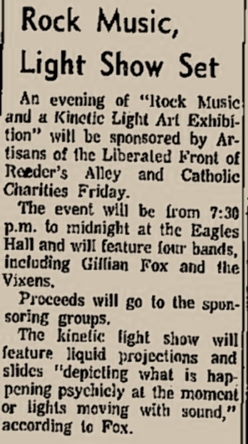 All seemed groovy until about July 24, when Fox negotiated a $400 loan (about $2,400 in today's money) at the Union Bank, using a collection of musical instruments as collateral, some of which finally turned out to belong to Helena musicians who had worked with Fox. 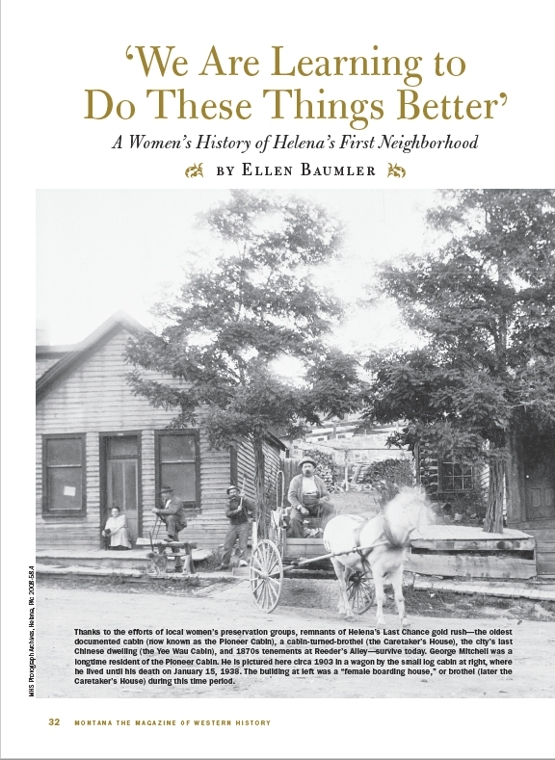 For the next several days, the Artisans proceeded to write a series bad checks to Helena merchants, using the $400 loan deposit slip as proof that the checks were good. In all, they wrote about $2,000 in worthless checks, which works out to around $12,000 today. One urgent task for the Artisans on July 27 was the repair of their vehicle, an old Dodge panel truck they had purchased earlier in Clancy. The repairs were paid for with bad checks. "We wish to express our thanks to the many wonderful and kind people in your fair city that have been so gracious in their hospitality . . . it has truly been a warm and bracing experience...In thanking all of you,we wish to single out one man, Mr. Gary Garrett, and thank him publicly for all the help, guidance, and opportunity be has given us." Garrett, a local entrepreneur, denied in an Aug. 4 letter to the Independent Record giving any help to the Artisans, saying that Fox approached him on two occasions with what Garrett called "inane schemes". "On the first occasion I told him that he struck me as an amateur conman and inept rumor monger", wrote Garrett. 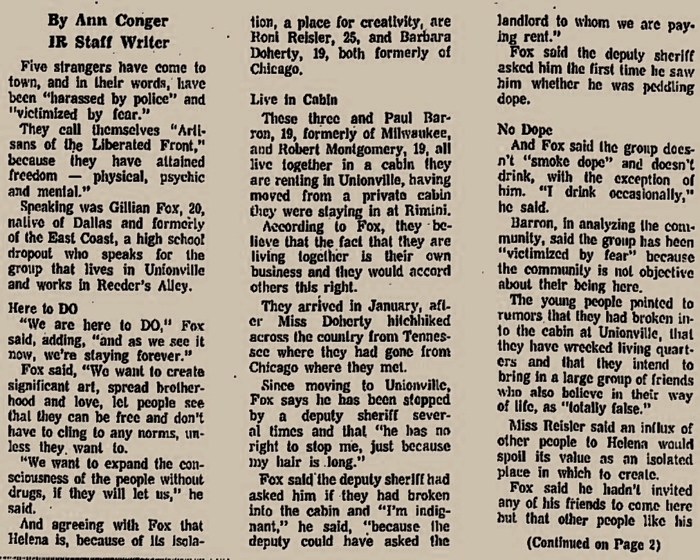 "On the second occasion I asked him to leave our place of business and lo stay away permanently." And here the story meets a dead-end. Your editor has contacted one of the Artisans, but they have so far been reluctant to tell their side of the tale. I do not know the legal status of the case.